I actually wasn't sure if I was going to pick this series up or not. I think Bendis has done a really good job with Guardians of the Galaxy, but I do think the market might be a little oversaturated with Guardians books right now. You have the core Guardians of the Galaxy series, Guardians 3000 (which was sadly unreadable), Rocket Raccoon, Starlord, and now Guardians Team-Up. But, I do try to give most #1's a read...if just for the purposes of reviewing them. So I decided to give it a look. If nothing else, I knew I would enjoy seeing Art Adams drawing both teams. In this issue, Starlord decides to pay a visit to Earth to visit his girlfriend, Kitty Pryde. The Guardians ship is attacked by a mysterious alien ship, and ends up crash landing on Earth. The Avengers arrive to see what's going on, and both teams end up fighting the Chitauri. The Chitauri suddenly retreat and someone drops a genetic disruptor on the heroes, knocking them all out. It's revealed to be Nebula, who is looking to bring a prize back to the Chitauri's master. 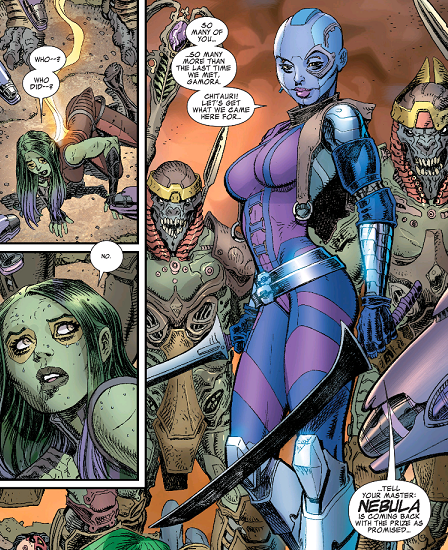 I think the last page implies that Gamora is the prize and Thanos is the Master, but I might have misread the situation. From pretty much the first page, I was laughing throughout this entire issue. Like I said a few times throughout my reviews of Axis, my favorite superhero comics are when the characters seem to enjoy being heroes. Too many Marvel and DC books focus on angst, so it's a true joy for me when the characters seem to be having fun. There is a lot of great banter through this issue, and some brilliant character moments. 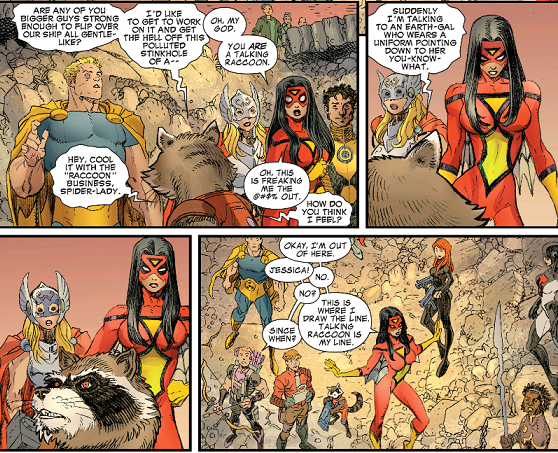 I'd never thought I could say that Spider-Woman and Rocket Racoon meeting would be the highlight of a comic, but it definitely was here. This issue made a huge arguement for me on why Bendis should still be writing Avengers. I've found Hickman's Avengers run to be boring at times. This has bothered me because there are a lot of characters I love in the series (like Cannonball and Sunspot). But I've found other writers (like Nick Spencer on Avengers World and now Bendis here) have done a better job making these characters feel unique and entertaining. Hickman has never quite balanced big dramatic stories with entertaining characters to me. I do admire the scope he writes on, but he needs to populate those stories with more relatable characters. I also like that despite the fact there are a ton of characters here, Bendis does a great job giving several different characters the spotlights throughout this issue. Even though the issue features Nebula and the Chitauri, even characters not featured in the Avengers and Guardians of the Galaxy movies get plenty of time and focus. Sure Hawkeye was able to take the Chitauri ship down by himself....but Hawkeye was cool long before he ever appeared in a movie. In the past, I have heard Art Adams say that he tended to be a "slow penciller," but that definitely benefited him here. He had to draw a ton of characters, including Guardians, Avengers, and Chitauri soldiers, plus he managed to throw a lot of nice touches in the backgrounds to help give this book a solid setting. There is a ton of detail throughout this comic, and I found myself looking at panels several times to catch all the little things Adams and Bendis slipped in. My only real complaint about this book is that it seemed like a real stretch that the Chitauri just happened to have a massive weapon that could take down all the heroes at once. It felt like a bit of a cop out. Honestly, this is a small complaint, and it didn't take away from my enjoyment of this comic at all. I also have to admit that I am a little sick of the Chitauri. For an alien race that was thrown into the movies seemingly just because Marvel couldn't use the Skrulls, they keep popping up in the comics. They are becoming as oversaturated (and ineffectual) as Hydra and AIM. If you need a generic alien army, just thrown in the Chitauri. But all in all, this was a terrific comic. It would have been easy for Marvel to just throw something together to cash in on Guardians success, but instead, you have a great comic by two of the best in the industry. The result was the best comic book I read this week. I usually complain about when Marvel ships a books two or even three times a month. In fact, the next issue of Guardians Team-Up comes out next week. But, instead of annoying me, I am actually looking forward to it. 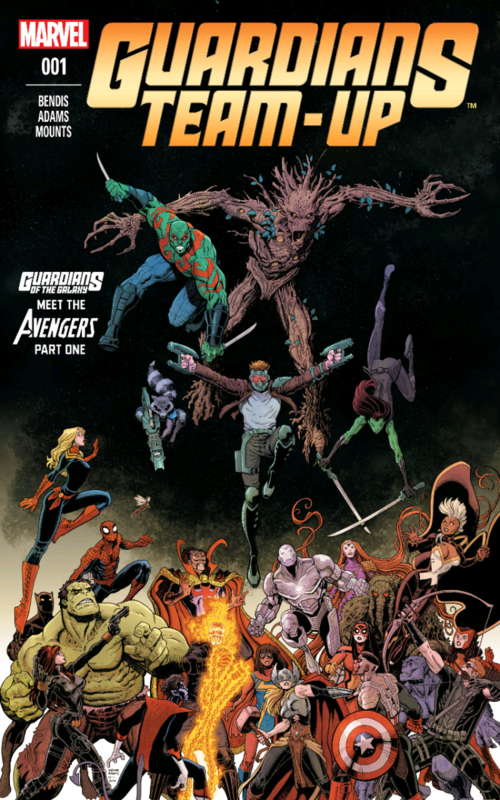 Part of it might be that this was a kind of dull week of comics for me this week, and Guardians Team-Up was pretty much the only comic I really enjoyed. But at the same time, Bendis and Adams did a great job with this issue, and I am glad that I picked it up. There are some genuinely laugh-out-loud funny moments throughout this. Adams' art is perfect and incredibly detailed considering how many characters feature throughout. Marvel really needs to stop using the Chitauri. They are the most generic alien race ever. Is it worth your $3.99? Definitely! This was by far my favorite comic book of the week. Granted, it was a pretty lame week of comics, but that doesn't change the fact this was a real good one. HIGHLY RECOMMENDED!